The 3rd African Feminist Forum took place in Dakar, Senegal in October 2010. Here are some reflections from the meeting. It’s was a wonderfully artsy weekend for me. There was so much for me to feed my senses on. 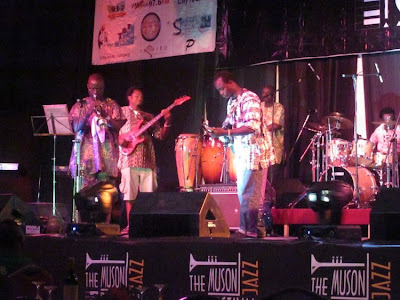 First off, there were 2 big jazz events taking place this week: the Lagos Jazz Series and the MUSON Jazz Festival. 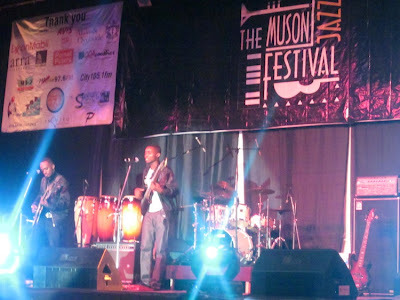 I would have loved to attend both, but there’s only so much time so I opted for the MUSON Jazz Festival. I had heard of none of the acts, but that was no deterrent to me. Together with a friend we went to take in the best of the scene. The evening started off with Yemi Sax playing the national anthem. Then OluJazz, a saxophonist, covered some popular songs including hits by Asa and TuFace. My friend asked me if that was jazz, which made me wonder what makes music jazz. Obviously, I believe I know what jazz sounds like and can quite confidently pull it out of a line-up of close affiliates. However, I remember when the lounge Jazz Sessions was open in Lagos. For the few months that it was in operation it drew huge crows – especially considering the deplorable state of that stretch of Ozumba Mbadiwe Way at the time. The name of the lounge would suggest that the music played there was jazz. However, what I heard whenever I was there were live covers of popular songs, which made me wonder if it’s jazz when the music is played by a live band. (Obviously I know this is not true, but it feels sometimes like that’s a big criterion around here). But I digress. The guitar duo, Pure and Simple, were up next and I was endeared to them almost immediately, because they both appeared nervous. Their playing was fantastic and their “short” pieces were actually not, but rather lengthy but accomplished renditions. There were a lot of artistes on the line-up and I guess all the acts must have been given a time limit, so I wondered about the need for the MC to move onto the stage and almost drag some of the acts off the stage. It was quite distracting to see him wandering amidst the playing artistes and it did not make for a very dignified exit for many of the acts. However, it did keep things moving along quite nicely without that prolonged wait period that you often get at concerts with multiple artistes as they move their staff on and off the stage. Mike Osadolo was a musician whom I recognized from my church and from an evening at Motherland. He confidently took charge of the audience with his dynamic playing. I couldn’t really describe Imole Africa’s music well enough, except to say that it sounded simultaneously deeply Yoruba and avant guard. I especially loved the first piece they played, which sounded like claps of thunder set to music. Then came Biodun & Batik, which was probably my favourite act of the evening. It was amazing, but somehow I loved all the songs they played. Biodun is the band leader and Batik is the band and together they played both covers and original compositions. I felt I had to run out and buy their CD (alas I wasn’t able to, but I have a birthday coming up so that’s a gift idea. ☺). Herbert Kunle Ajayi (HKA) was maybe my next favourite act. Both he and B&B played what sounded the most like traditional jazz, but with a freshness that kept them from sounding boring. There was a lot of anticipation built-up for the final two acts of the evening: Ayinke Martins and Lekan Babalola. Ayinke Martins was the big jazz vocalist of the night and had a voice like velvet; while Lekan Babalola had the biggest band of the night with correspondingly majestic melodies. Unfortunately, I could not stay until the end of the concert. At 11.30pm, Lekan Babalola was outlining his repertoire and it sounded like he planned on being there until 1am. I had an early start the next morning and regretfully took my leave. It was an extremely satisfying evening for the humble sum of N2,000, however the program notes showed that due to the difficulty in raising money for the event, it very nearly didn’t take place. I felt sad about that, because the big companies appear to be stumbling over themselves to sponsor comedy and reality shows. So kudos go to the companies who did support the jazz festival. I look forward to next year being even better. Omenka Gallery presents Reconstruction in Reverse, a photographic exhibition. Reconstruction in Reverse is an exciting and challenging exhibition analyzing the role and impact each individual Nigerian has on our collective identity as a nation and how we define ourselves in an increasingly contemporary world. RECONSTRUCTION in REVERSE or deconstruction brings together portraits of the famous, infamous and non famous, but just as important! The intimacy of portraiture will enable the audience to gain an increased perspective and understanding on issues relating to self discovery and awareness. The exhibition employs deconstruction as a strategy of critical analysis and seeks to challenge the displaced and misinterpreted Nigerian identity forced on us by addressing commonly held social stereotyping and assumptions. In constructing the photographic identities of the subject many of the portraits on view are taken in various environments and situations which provide a graphic beauty and simplicity as well as a distinctive narrative content in the theatricality of human action. The exhibition will feature thirteen of Nigeria’s prominent contemporary photographers including Adolphus Okpara, Ebikware Okiy, Isaac Emokpae, Jide Adeniyi-Jones, Jide Alakija, Kelechi Amadi-Obi, Lolade Cameron-Cole, Mudi Yahaya, Nnamdi Ijiomah, Tam Fiofori, TY Bello, Uche James-Iroha and Yetunde Ayeni-Babaeko. The Emma Willard School for girls in the United States and the Shelby Cullom Davis family have established a program to attract highly motivated, potential future leaders. For the 2011-2012 year, the Davis family has arranged to provide two $20,000 scholarships to qualified international candidates. Grants are needs based and, if a student qualifies, she may be eligible for financial assistance up to an additional $25,000. Students may be enrolled in the 10th and 11th grades (equivalent to SSS 1 and SSS 2). Upon graduation from Emma Willard School, Davis Scholars are eligible for continued scholarship support at any of the 89 Davis United World Scholars colleges and universities in the United States. Emma Willard is one of the U.S' preeminent girls' schools, grades 9-12 (JSS 3 - SSS 3), fostering in each young woman a love of learning, the habits of an intellectual life, and the character, moral strength, and qualities of leadership to serve and shape her world. Find out more about the Emma Willard School: www.emmawillard.org. Contact Jeffrey Pilgrim, the director of admissions (jpilgrim@emmawillard.org) for more information. The PearlRichards Foundation and the University of Ghana Business School, Ghana , are organizing a one day forum on Internet and mobile entrepreneurship in Ghana. The forum seeks to showcase the innovative use of new media – internet and mobiles – by entrepreneurs to address the socio-economic and development challenges in Ghana. This year’s theme is Building Ghana through Internet Enterprises and Mobile Innovations. 1. To offer participants an opportunity to share, discuss and learn from individual career experiences and profiles of Ghanaian Internet and Mobile entrepreneurs. 2. To educate participants on how to use Internet and mobile resources and applications to support and promote their creative ventures. The forum will take place on November 5, 2010 at the University of Ghana Business School. GIMEF 2010 will encourage open minds, critical thinking, self-examination, creativity, and sharing ideas. Technology entrepreneurs presenting at the forum include: Excelle Ghana, Silky Productions, Mobile Content Ghana, Txt Ghana, Funeralsinghana and Esoko Ghana. Visit TESS Africa, www.tessafrica.org to read more. The forum is a pre-conference towards the Africa Internet and Mobile Entrepreneurs Conference in Uganda, December 10 (www.afiec.com). GIMEF and AFRIEC are both events organized by the Technology Entrepreneurs Seminar Series (TESS Africa www.tessafrica.org). TESS aims at inspiring African Youth and Graduates into Technology Entrepreneurship and it is supported by the PearlRichards Foundation (www.pearlrichards.org), PC Tech Magazine (www.pctechmagazine.com) and Uganda Telecom.